Food waste is a pressing global issue with no sign of slowing down. At least one third of the world’s food produce is discarded: that’s enough to feed 870 million people (a figure greater than the entire population of Europe). Here in the UK, 40 per cent of all fruit and vegetables are rejected before reaching shelves, considered ugly, misshapen, too big or too small; yet they remain absolutely edible. 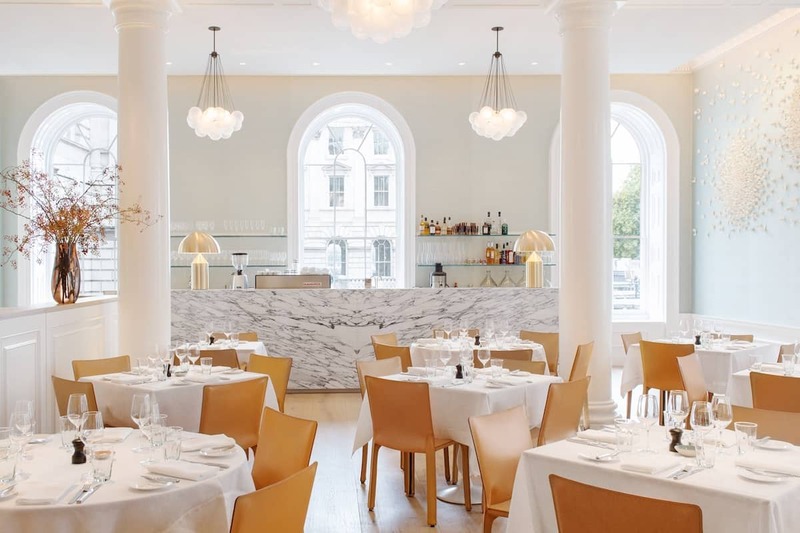 Former Head Chef of Petersham Nurseries, Skye Gyngell aims to combat food waste at Spring, her restaurant in the new wing of Somerset House, with a ‘scratch’ menu which utilises produce that would otherwise be wasted. Launched in 2014, Spring is a fine dining restaurant with a prominent focus on seasonal produce with ingredients at the forefront, having grown a solid reputation for both its food and service. “We hope to create an experience which not only sings on the plate but lingers in the memory”, the restaurant’s website reads. At the end of 2016, the restaurant also launched an early evening ‘Scratch’ menu. Derived from Gyngell’s Australian roots, the menu’s name honours ‘scratch tea’ – a sustainable practice of creatively producing dishes from scraps of ingredients found in the fridge (like all of the best pre-pay-day sandwiches). Available between 5:30 – 6:30pm, Spring’s Scratch menu has a commendable emphasis on sustainability, featuring a daily-changing three-course meal which champions often overlooked ingredients – offering exceptional value at £20 per-person. Rather than being fancy or complicated, the dishes are produce-driven, featuring organic ingredients used as the base for elegant yet wholesome dishes. Think soups made from potato skins and beetroot tops; pasta dishes made from fresh pasta trimmings, finished with leftover cheese; yesterday’s bread used in bread pudding. One dish is available per course, so guests with dietary restrictions are advised to order from the a la carte menu. Moreover, following the launch of a ‘festive’ Scratch menu at the end of last year, a ‘Weekend Scratch’ offering will be launched at the end of this month, with the last Saturday service of each month set to include two options for each course (incorporating a vegetarian alternative). Alongside the “scratch menu”, Skye Gyngell has also announced plans to reduce the single-use plastics at Spring. In addition to removing plastic straws and looking into bio-degradable cling film alternatives, the restaurant will aim to completely eradicate the use of plastic containers and other single-use plastics, with the aim of becoming one of London’s first plastic-free restaurants this year. On a recent Friday evening, the restaurant was already busy during early dinner service: the airy, elegant dining room alluring a pre-theatre crowd without stooping to serving uninspired throwbacks from the 1970s with perfunctory, conveyor belt service. During the Scratch offering, service is warm, efficient, fast-paced but never hurried. Dinner began with a basket of “yesterday’s” sourdough, served warm and unexpectedly springy – accompanied by a coin of salted butter and olive oil for dipping. A relatively robust starter followed: tagliolini made with re-rolled offcuts of pasta dough, cooked al dente and lavished with an unapologetically rich, seasonally comforting ragù of oxtail, rampant with red wine and showered with parmesan. A decidedly lighter main showcased lettuce hearts, heavily charred and served with bulgur wheat lifted with harissa and a heap of gremolata punchy with garlic. A symphony of simply prepared ingredients working in sweet harmony without the need of flesh to excite. To follow, roulade meringue would have benefitted from a less restrained helping of sugar to camouflage the taste of egg white. An accompanying raspberry coulis, on the other hand, was intense and had pleasant palate cleansing power. A fine conclusion to an enjoyable dinner at one of central London’s most socially conscious fine dining establishments. Spring can be found at Somerset House, Lancaster Place, London, WC2R 1LA. Could the humble Hash be the solution to our food waste problem? Has fussy eating created our food waste crisis?